LepidOLF is an ANR project aiming at better understanding olfactory mechanisms in insects, the objective is to characterize and study the family of the olfactory receptor (OR) proteins in Lepidoptera, by a transcriptomic approach, alternative to the genomic approach to identify highly divergent odorant receptors, usually in non-model insects. 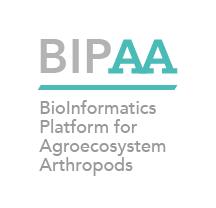 All the bioinformatics part of this project has been done on the GenOuest and BIPAA platform and leads to 4 recent publications (Legeai et al 2011; Jacquin-Joly et al 2012; Poivet et al. 2013; Glaser et al 2013). The pea aphid genome has been helpful to describe the protein coding genes genes having a role in the adaptation of the aphids to the seasons. The aim of the project is to analyze the putative interaction and inactivation of these genes by small regulatory RNAs (miRNAs). It is necessary to deliver appropriate computing tools adapted to biology (bioinformatics) and mathematics to predict or model these interactions. In that frame Valentin Wucher started a PhD funded by INRA and Region Bretagne in the Dyliss team since september 2011. Through complementary approaches to evolutionary genomics, population genetics, reproductive biology and functional analysis, this project aims to decipher the genetic architecture underlying the ecological specialization and reproductive isolation and identification of loci and genomic regions involved in the trophic adaptation in the pea aphid complex. It is based on genomic resources including the resequencing of more than 40 complete genomes of biotypes of the pea aphid. All the data management, integration analysis and integration is attributed to the GenOuest and BIPAA platforms. The first aim of the project is to record all sources of genetic variation between two strains of Fall Armyworm by comparing their whole genomes of but also by measuring levels of host based genetic divergence and of genes flow between field individuals on different host plants. A second aim of the project is to identify genes involved in adaptation to the host plant and their regulation. As a results, bioinformatics and in particular in the fields comparative genomics and epigenomics is a major component of the project. All the data management and bioinformatics will be achieved on the GenOuest and BIPAA platforms with a tight partnership of the INRIA GenScale team.